We are so fortunate to work with some of the best interior designers on incredible projects of all shapes and sizes. 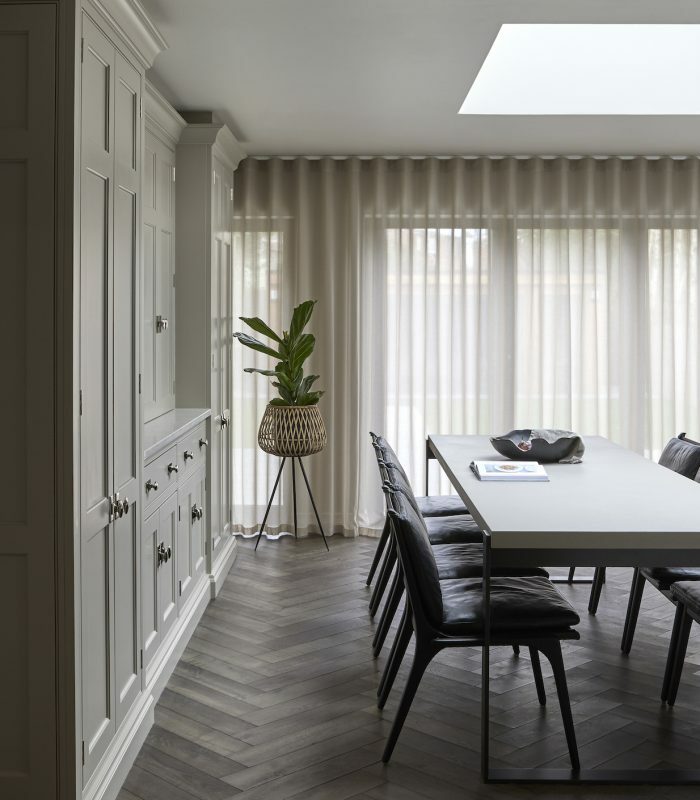 We have had the pleasure of working closely with the super talented Cherie Lee Interiors on a number of stunning projects, with one of the most recent being the Victorian Family Home, Hertfordshire which we featured on our blog here. Cherie Lee Interiors are know for blending classic and contemporary styles seamlessly while creating liveable interiors that you instantly fall in love with. This recently photographed West London project is the epitome of cool, calm luxury. Cherie Lee Interiors have created a series of spaces in this family home that are a clever mix of light and dark textures and furnishings that invite you in, creating a wonderful family space. The kitchen and dining area flows through from the living room and is flanked at each end by Nickleby cabinetry finished in H|M paint colour Tailored Grey, with polished nickel hardware throughout. The darker island is finished in H|M Top Hat and is used as the main food prep area with a sink, integrated dishwasher and steam oven. Directly opposite is the cooking/ food storage run which has a Wolf range cooker with a Teppanyaki, huge wok ring and gas burners. Above the Wolf is a false chimney that cleverly conceals a powerful Westin extraction unit and antique effect mirror splashback behind. To the left of the range cooker is a day pantry which provides masses of dried food storage and to the right a large Sub-Zero fridge freezer. Zoning both cold and dried food so close to the range cooker and island is ideal for easy food prep, and the antique effect mirror splashback behind the Wolf allows the host to carry on conversations with guests perched at one of the stools at the island – or sat at the nearby dining table eagerly awaiting dinner. On the opposite side of the room closest to the dining table is a tall run of cabinetry, both ends open to reveal crockery cupboards and at the centre is a double breakfast/ appliance cupboard. This double countertop cupboard has a Quooker hot tap which is ideal for making a pot of tea or coffee for guests sat at the table at the weekends. 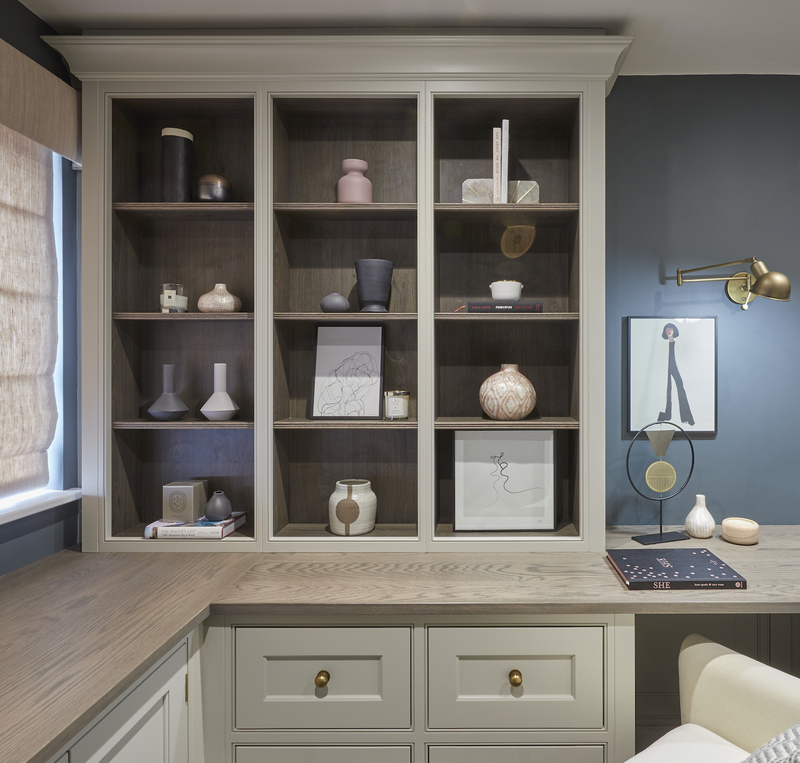 This study cabinetry has been finished in H|M paint colour Half Windsor and Berkeley oak wood finish on the interior and worktop which gives this workspace a really warm and calm feel especially when paired with the aged brass hardware. To view more work by the talented Cherie Lee Interiors or to make an enquiry visit the website here, or to find out more about our kitchens email us at info@humphreymunson.co.uk or call us 01371 821300.